'California Split' Makes it to DVD California Split, the 1974 Robert Altman film about two obsessive gamblers, is now available on DVD. It had never been made available on video for the home audience. Hear NPR's Scott Simon and New York Times critic Elvis Mitchell. 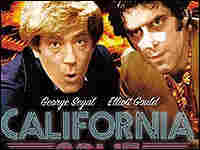 California Split, the 1974 Robert Altman film about two obsessive gamblers, is now available on DVD. It had never been made available on video for the home audience. Hear NPR's Scott Simon and New York Times critic Elvis Mitchell.